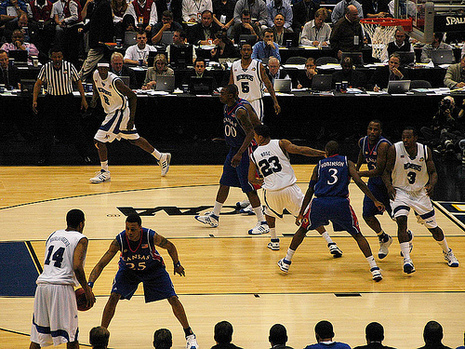 The 2008 NCAA Men's Division I Basketball Tournament involved 65 schools playing in a single-elimination tournament to determine the national champion of men's NCAA Division I college basketball as a culmination of the 2007–08 basketball season. 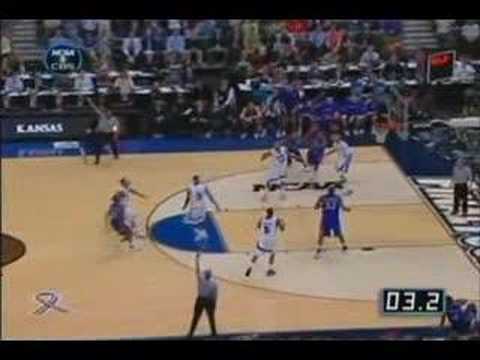 It began on March 18, 2008, and concluded as the Kansas Jayhawks defeated the Memphis Tigers 75-68 in overtime on April 7 at the Alamodome in San Antonio, Texas, to win their third national championship. The host institution was the University of Texas at San Antonio. For the first time in tournament history since seeding began, the top seeded team from each of the four regionals made it to the final four: Kansas, Memphis, North Carolina, and UCLA. Entering the tournament on March 18, the top ranked team was North Carolina in both the AP Top 25 and the ESPN/USA Today Coaches' Polls, followed by Memphis, UCLA and Kansas. American University, UMBC, Texas-Arlington, and Portland State all entered the tournament for the first time in their school's history. Another school, Coppin State won the MEAC Tournament to became the first 20-loss school ever to make the field. The first round of the tournament featured some unprecedented upsets, with four upsets in all four games played in Tampa. The surprise of the tournament was tenth-seeded Davidson, who advanced to the Elite Eight before losing to eventual champion Kansas 59-57, each team's closest game of the tournament. The total tournament attendance of 763,607 set a record for highest total tournament attendance, breaking the record set during the 1999 tournament. For the first time since the current seeding system started in 1979, all four #1 seeds made it to the Final Four. Memphis became the first team ever to win 38 games in one season by defeating UCLA 78-63. Chris Douglas-Roberts, who scored a game-high of 28 points, combined with Derrick Rose to score a total of 53 of Memphis' 78 points. 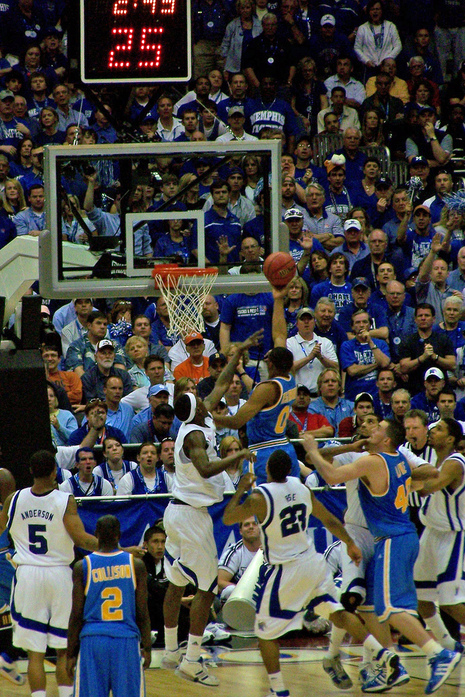 UCLA star Kevin Love was held to 12 points, and the Bruins lost their third straight Final Four game. Memphis had lost to Ohio State in the Alamodome in the 2007 tournament, and had made it a goal to win in the arena in this year's playoff. The second semifinal game could be divided up as if it were three different games. The Jayhawks took a 40-12 lead in the first 15 minutes. North Carolina narrowed the deficit to 17 at halftime and opened the second half on a 23-10 run to close to within 4 points with 11 minutes to play. After the teams traded baskets for a few minutes, Kansas pulled away, closing on a 20-7 run for a 84-66 victory over the tournament's #1 overall seed. 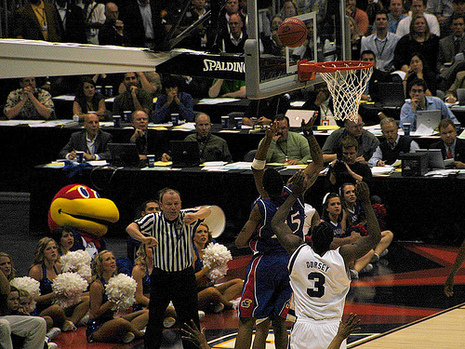 Brandon Rush led the Jayhawks with 25 points. Kansas' defense held the AP Player of the Year, Tyler Hansbrough, to 17 points and 9 rebounds, slightly below his season averages. The Tar Heels were led by Wayne Ellington's 18 points. 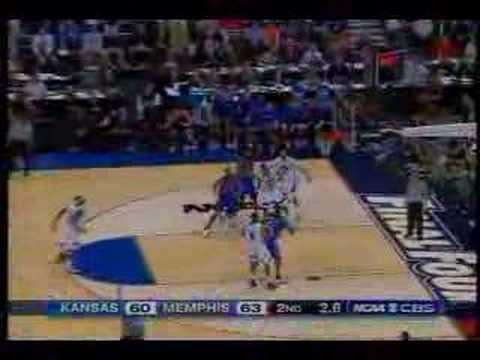 The National Championship Game pitted Memphis against Kansas. Neither team's head coach (KU's Bill Self and Memphis' John Calipari) had garnered a national championship during their head coaching careers, either. 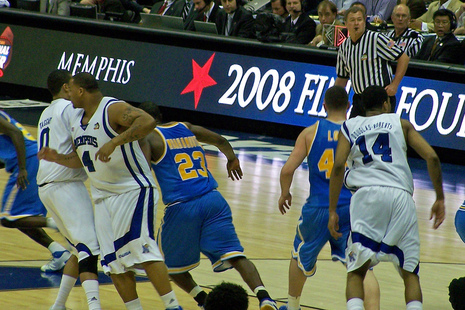 Memphis guard Chris Douglas-Roberts had been the leading scorer in the tournament, averaging 23.6 points per game. Memphis became the first team currently from a conference other than the six majors to play in the championship game since 1998. Utah advanced to the championship game in 1998, and UNLV was the last team from a non-major conference to win the national title in 1990. On the day of the game, the betting lines set by Las Vegas casinos Las Vegas Hilton, Station Casinos, and The Mirage made Memphis the favorite by a spread of 2 points. After a back-and-forth first half, Kansas led 33-28 at halftime, the first second-half deficit that Memphis faced in the entire tournament. Memphis scored the first five points of the second half to tie the score at 33 with 18:57 left in regulation. The two teams traded the lead until Memphis used a 10-0 run to build a seven-point lead with 5:10 remaining and increased it to nine points with 2:12 remaining in regulation. Kansas strategically fouled Memphis, which missed four of its final five free throws in regulation while Kansas furiously scored 12 points in the final two minutes of regulation. During that stretch Kansas made 100% of their shots going 2 for 2 from 2 point range, 2 for 2 from 3 point range and 2 for 2 from the free throw line. Kansas guard Mario Chalmers hit a three-point basket with 2.1 seconds remaining to tie the game at 63, and the game went into overtime. It is now immortalized as Mario's Miracle. In overtime, Kansas scored the first six points en route to a 75-68 win. They continued the blistering stretch they started in regulation, going 4 of 6 from the field and 4 of 4 from the line in overtime. 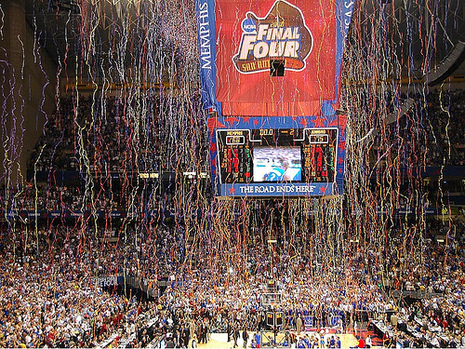 It was Kansas's fifth national championship overall and third championship since the NCAA began the modern tournament in 1939. It was also the first national championship for the program since the 1988 team. This was the 7th overtime National Championship Game in NCAA Division I tournament history. It also represented the first national title for a school representing the Big 12 Conference. SAN ANTONIO — The sign on the scoreboard looming above the court at the Alamodome reads: The Road Ends Here. 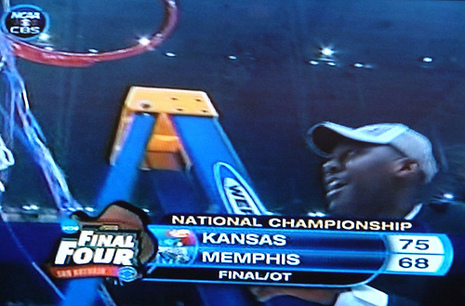 A Final Four that included four No. 1 seeds for the first time had an aura of greatness and high expectations. Kansas and Memphis made sure that college basketball fans would not soon forget what happened inside the Alamodome Monday night. SAN ANTONIO — The championship was 15 years in the making, though at times it might have felt like 50 for Kansas coach Bill Self. Self, one of the most successful active coaches, has an NCAA championship to his credit. 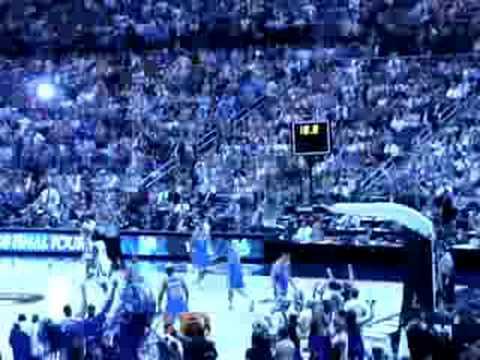 Mario Chalmers helped deliver it by forcing overtime with a three-pointer with 2.1 seconds left in regulation against Memphis in the NCAA tournament championship game Monday night at the Alamodome. Kansas scored six consecutive points to open the extra session, all but sealing Memphis' fate in the Jayhawks' 75-68 overtime victory. "I just know it was a big shot," Chalmers said. The Jayhawks (37-3) gave the school its third NCAA tournament title and first since 1988. "It was a fabulous game," Self said. "Both defenses were great. We just labored offensively, but God, we competed hard on every possession. There's no quit in these guys."